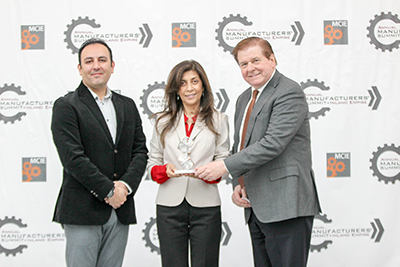 During the annual Manufacturer’s Summit, a special award ceremony is held to celebrate the most innovative businesses and leaders in the Inland Empire. These leaders have great ideas for growing the business, dramatically improving performance and addressing some of the toughest challenges in today’s manufacturing industry. E=mc² Innovation Awards will be presented to local manufacturers who submit the best innovations that result in tangible business improvement. Local companies, Technical Employment Training, and Brithinee Electric worked together to produce the Innovation Award Trophies. What types of innovations qualify? Innovation in Marketing – these innovations relate to marketing and sales that result in business growth, market share and/or increased repute. Innovation by Students – these innovations could fall into any of the categories above and must be designed or developed by manufacturing students. To nominate a manufacturer for an Innovation award, please complete this form. The Innovations Award committee judges the applicants. This committee is comprised of people with a minimum of over 20 years of manufacturing experience with typically additional expertise with an academic institution or trade association/ non-profit Board supporting the industry. The applications are evaluated based on the innovation and the evidence (and quantification) of tangible results, directly attributable to the innovation. Although we receive applications from all categories, we might or might not have an award recipient in each category each year. The title of the award came about because E=mc² is the most fundamental physics formula that allows our universe to exist. Similarly, we believe there are some basic ideas applicable to most businesses that can help them become more efficient. The underlying theme of the Manufacturers’ Summit is finding solutions to current and future challenges. The businesses that face those challenges provide the greatest resource for those answers. The E=mc² Awards are designed so those who have the solutions will have a chance to share their ideas, with a 5 minute presentation on the main stage, receiving publicity for their innovation and company. The E=MC² trophy was originally designed by a budding inventor and entrepreneur named Dustin Venegas. He had an idea for a product, but could find no one to build a prototype at a reasonable cost. Determined to make the product, he bought a Haas CNC machine tool, taught himself how to use that machine and started making his inventions for sale. He was asked to use his imagination to create a unique trophy using several Turner’s Cubes for the E=MC² Awards. Unique and with an elegant design, Mr. Venegas created the trophies himself, for five years. For the Manufacturers’ Summit in years six and seven, the trophies have been a joint effort. Bar stock material was furnished by Brithinee Electric (Colton) and K-H Metals (Riverside), to the instructors at Technical Employment Training, Inc. (TET), along with a sample trophy. 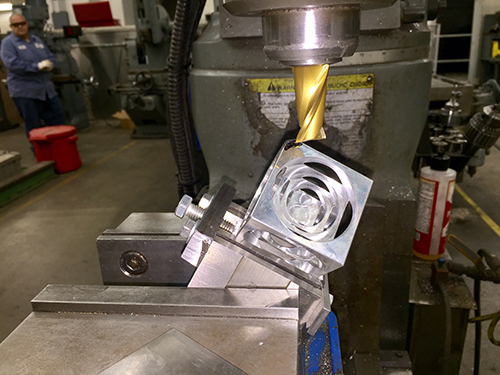 There, students were given the task of reverse-engineering the trophies, then making the Turners’ cubes on CNC machine tools at the school. The cubes were returned to Brithinee Electric for engraving, polishing, and final assembly.